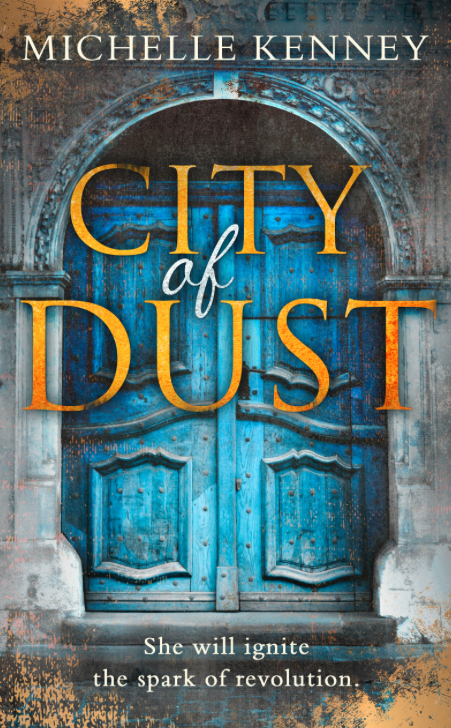 Today we're excited to chat with Michelle Kenney, author of City of Dust. Read on for more about Michelle and her book, plus a giveaway! In between scribbling, Michelle love reading, running, attempting to play bluegrass and treasure-hunting on deserted beaches with her young dreamers-in-training. Michelle holds a LLB (hons) degree, an APD in Public Relations and is an Accredited Practitioner with the CIPR (with whom she's won awards for Magazine & PR work). But she is definitely happiest, curled up against a rainy window, with her nose in a book. Michelle is represented by Chloe Seager of Northbank Talent Management, and loves chatting all things book-related at https://www.facebook.com/BookofFireMK Twitter: @mkenneypr and Instagram: @michken01. But with the shadow of the Black Aquila looming ever closer, will she put the freedom of others above her own, or will she follow her heart?This is Michelle Kenney’s thrilling second instalment in the Book of Fire Trilogy. Definitely the novel. While I was writing, I initially called the book ‘Genetica' to reflect its genetic theme. But when Hannah Smith, my first Editor, starting reading about the *Voynich Manuscript theme (the *Voynich is a real, medieval manuscript that has never been deciphered - my books hypothesise that there may be 'one or two' mythological secrets hidden within its ornate cryptic text) she immediately suggested ‘Book of Fire’ which felt much wider and enigmatic. In the first book, ‘Book of Fire’, it has to be the Flavium scene. The Flavium is the original Latin name for the Colosseum, and is a Pantheon replica of the ancient combat arena. While in the Flavium, Talia finally glimpses beneath August’s veneer in the most harrowing of circumstances - watched by a baying crowd, surrounded by blood-thirsty Griffins, and faced with the proposition of watching her brother and best friend die. It is also the moment she witnesses her silent brother’s transformation from 'boy to hero', and learns what a true hero looks like in the shape of her cyclopean bff!! That writing is a continuous journey. There is no end destination, merely stops along the way, interspersed with plenty of peaks and troughs! So, while gaining an agent, a deal, and a royalty cheque can all be very nice, none of these building blocks are end points in themselves. Even for the most successful writers, there is no such thing as having 'made it’, because there is always another book, another series of editing hurdles and the test of the open market to navigate. Writing is hard, involves very long working hours, and means facing a lot of rejection - which is why it so important to enjoy and celebrate each step, no matter how big or small. For City of Dust it has to be the colour. And the doorway beckoning the reader through, which seems almost metaphorical in a way as it's a fantasy book. Also the sprinkling of gold dust, which appeases the little girl in me. 7. What new release book are you looking most forward to in 2018? Muse of Nightmares by Laini Taylor which also comes out Oct 2!! I’m a huge fan and everything she writes has that killer mix of fantasy, tangibility and heart. Just brilliant. The Hate U Give by Angie Thomas. For obvious reasons, and I can’t wait for the movie. 10. Is there anything that you would like to add? 11. Which was the most difficult or emotional scene to narrate? 12. Which character gave you the most trouble when writing your latest book? Definitely the brooding enigma of a Roman Knight, August! He was absent for the first part of the City of Dust to allow Max and Talia a little time to rekindle their relationship, so even I felt he was a bit of a stranger when he was reintroduced and the fireworks began to fly! 13. Which part of the writing process do you enjoy more: Drafting or Revising? I love both, but it completely varies according to my mood. If pushed, it would probably be drafting. 14. What would you say is your superpower? Crazy Origami! I can make a very mean party-hat &/or unsinkable ship *super fast. This jaw-dropping skill has been known to wow and calm many tantrum-prone children (and adults) on occasion. 15. Is there an organization or cause that is close to your heart? I am also involved with Operation ShoeBox and, together with the rest of the local village, try to help best our running annual total of around 50 boxes each year. Two winners will receive a bundle giveaway of bound copies (or digital - whichever preferred) of both Book of Fire & City of Dust (International). The cover is very dramatic. The synopsis is very compelling. Sounds like an amazing series. The cover is gorgeous and the synopsis sounds exciting. Can't wait to read it. I like the cover and the synopsis sounds exciting. The cover is beautiful and mysterious. This series sounds amazing. Such a pretty cover, with great pops of color, the book sounds like a page turner!